Today with computers becoming part of our lives, all of us have to do a lot of typing. I have observed many people using the keyboard and found that the majority use only 1, 2, 3 or maximum 4 fingers to type. They also have to look at the keyboard while typing to type without mistakes. Touch-typing is the art of typing without looking at the keyboard. When you are a touch typist you will use all your fingers to type. You will use the correct fingers to strike the correct keys. You will increase your typing speed and your productivity. You will reduce the number of typing errors. You will do all these without looking at the keyboard–that is the beauty of touch-typing. Till now, mostly stenographers, personal assistants, secretaries and other data entry operators have practiced touch-typing. In today’s competitive world where everyone is required to work on a computer, the single finger or two finger typing will not do. Every one who uses the computer (especially the information worker who uses it for performing almost 80% of his/her tasks) needs to learn how to type correctly—i.e., learn touch-typing. Touch typists can do more work in fewer hours, giving them extra time to devote to other tasks as their typing speed will increase many times. Touch-typing is a skill like riding a bicycle–a skill that can be learned and can be perfected and improved by practice. So once you have learned touch-typing in the correct way, the more you practice, the faster and better you get. Touch-typing will improve your productivity. As you reach higher speeds, you will be able to finish your typing tasks–composing an email, writing a letter, posting an entry in your blog, completing a class assignment or preparing a project report–in much lesser time. When you are touch-typing, you need not look at the keyboard. This will free your mind and help you in better organizing and structuring the material that you are typing. Another advantage of touch-typing is that it frees the eyes from the keyboard. The single, two or three finger typists are typing incorrectly–they are not using the correct fingers to tap the keys. So even if they have been typing for many years, there is a limit to which their typing speed will increase. 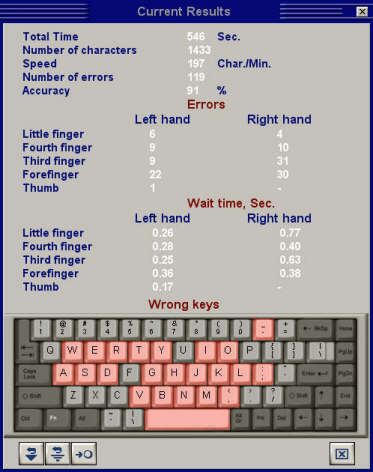 Touch-typing is the correct way of typing where you use the correct fingers to tap the various keys. Touch-typing has many advantages. One, once you have learned touch-typing, the more you type your typing speed will increase. Second, since you are typing in the correct method, the typing load is evenly distributed between all the fingers and so the chances of typing related injuries are less. Third, since you don’t have to look at the keyboard while typing, the eyestrain is reduced. So by learning touch-typing, you can increase your typing efficiency. You get more time for other activities. You will also straining your fingers and eyes to a lesser degree, which reduces fatigue and tiredness. You can use the time you save to do your favorite activities. Typing Tutor by Media Art is an excellent software program that helps one learn touch typing easily, effectively and efficiently while having fun. The creators of this software have taken great care in making the software as user-friendly as possible. The interface is intuitive and pleasing and is a marvel of aesthetic and ergonomic excellence. Typing Tutor consists of 40 basic lessons, a word and a sentence drill and 16 sample texts. The 40 basic lessons teach touch typing of alphabets, numbers and the special characters. The word and sentence drills help one to improve the typing skills learned in the first 40 lessons. The 16 sample texts simulate the real world typing experience. You can create your own lessons using the “Advanced Lessons” feature. After completing each exercise, you will get a result card showing your speed, accuracy, problem fingers and difficult keys, etc. Typing Tutor can be used by more than that one person and the program keeps track of each person’s progress. Training reports, which gives the lessons covered, typing speed, accuracy, etc., can be obtained for each person. This excellent software offers numerous games that make learning fun while improving the typing skills. There are also games that teach the proper usage of the mouse. Another advantage of this software is that almost all the features are customizable and can be set to suit the individual preferences of the learner. You can buy the product from Media Art’s web site. I wonder if you would read this. I read about you in Readers Digest last night and I am awed ! You looked v dashing in your youth. Anyways, I would like to state that Mavis Beacon typing tutor is the best typing tutor ever made. MBTT is a good product. But this product is eqally good and the price is only one-third. I have reviewed a lot of typing tutors and most of them are equally good and almost all of them have almost same or similar features.